Endothelial colony forming cells (ECFCs) are circulating endothelial cells with robust clonal proliferative potential that display intrinsic in vivo vessel forming ability. Phenotypic and functional characterization of outgrowth endothelial cells derived from CB are important to identify and isolate bona fide ECFCs for potential clinical application in repairing damaged tissues. Prasain, N., Meador, J. L., Yoder, M. C. Phenotypic and Functional Characterization of Endothelial Colony Forming Cells Derived from Human Umbilical Cord Blood. J. Vis. Exp. (62), e3872, doi:10.3791/3872 (2012). Longstanding views of new blood vessel formation via angiogenesis, vasculogenesis, and arteriogenesis have been recently reviewed1. The presence of circulating endothelial progenitor cells (EPCs) were first identified in adult human peripheral blood by Asahara et al. in 1997 2 bringing an infusion of new hypotheses and strategies for vascular regeneration and repair. EPCs are rare but normal components of circulating blood that home to sites of blood vessel formation or vascular remodeling, and facilitate either postnatal vasculogenesis, angiogenesis, or arteriogenesis largely via paracrine stimulation of existing vessel wall derived cells3. No specific marker to identify an EPC has been identified, and at present the state of the field is to understand that numerous cell types including proangiogenic hematopoietic stem and progenitor cells, circulating angiogenic cells, Tie2+ monocytes, myeloid progenitor cells, tumor associated macrophages, and M2 activated macrophages participate in stimulating the angiogenic process in a variety of preclinical animal model systems and in human subjects in numerous disease states4, 5. Endothelial colony forming cells (ECFCs) are rare circulating viable endothelial cells characterized by robust clonal proliferative potential, secondary and tertiary colony forming ability upon replating, and ability to form intrinsic in vivo vessels upon transplantation into immunodeficient mice6-8. While ECFCs have been successfully isolated from the peripheral blood of healthy adult subjects, umbilical cord blood (CB) of healthy newborn infants, and vessel wall of numerous human arterial and venous vessels 6-9, CB possesses the highest frequency of ECFCs7 that display the most robust clonal proliferative potential and form durable and functional blood vessels in vivo8, 10-13. While the derivation of ECFC from adult peripheral blood has been presented14, 15, here we describe the methodologies for the derivation, cloning, expansion, and in vitro as well as in vivo characterization of ECFCs from the human umbilical CB. EBM-2 (Lonza, Cat. No. cc-3156) supplemented with the entire SingleQuot kit supplements & growth factors (Lonza, Cat. No. cc-4176), 10% (v/v) fetal bovine serum (FBS) and 1% (v/v) penicillin (10,000 U/ml)/streptomycin (10,000 μg/ml)/amphotericin (25 μg/ml). Store up to 1 month at 4 °C. Recommended EGM-2 volumes to use for ECFC culture are 500 μl/well for 24-well plates, 2 ml/well for 6-well plates, 5ml/25-cm2 flasks, and 10 ml/75-cm2 flasks, unless otherwise specified in the protocol. Dilute 0.575 ml of glacial acetic acid (17.4N) in 495 ml of sterile distilled water (0.02 N final concentration). Sterile filter the dilute acetic acid with a 0.22-μm vacuum filtration system. Add 25 mg rat tail collagen I to the dilute acetic acid to a final concentration of 50 μg/ml. The amount of collagen added will vary depending on the collagen stock concentration. Store up to a month at 4 °C. Place 1 ml of collagen I solution in each well of a 6-well tissue culture plate (use 300 μl/well for 24-well plates, 3ml/25-cm2 flasks, and 8 ml/75-cm2 flasks). Incubate 1 hour to overnight at 37 °C. Remove the collagen I solution and wash surface two times, each time with PBS (use 500 μl/well for 24-well plates, 2 ml/well for 6-well plates, 5ml/25-cm2 flasks, and 10 ml/75-cm2 flasks). Use plates immediately for cell cultures. Phosphate-buffered saline (PBS) supplemented with 2% (v/v) fetal bovine serum (FBS). Store up to 2 weeks at 4 °C. Collect CB with heparin (10 U heparin/ml blood) or EDTA as an anticoagulant and transport to the laboratory at room temperature and immediately (within 2 hours of infant's delivery) process the sample for mononuclear cell (MNC) isolation. Aliquot 15 ml of CB into each 50-ml conical centrifuge tube and add 20 ml of PBS to each tube of CB and pipette several times to mix. Draw up 15 ml Ficoll-Paque into a 20-ml syringe and attach a 20G needle or mixing cannula. Place the tip of the mixing cannula at the bottom of the tube of diluted blood and carefully underlay 15 ml Ficoll-Pague. Centrifuge the tubes 30 min at 740 x g, at room temperature, without the deceleration brake setting. Using a transfer pipette, remove the hazy layer of low-density MNCs located at the interface between the Ficoll-Paque and diluted plasma. Dispense the MNCs into a 50-ml conical tube containing 10 ml EGM-2 medium. Centrifuge the MNCs 10 min at 515 x g, at room temperature, with a high deceleration brake setting. Carefully aspirate and discard the supernatant. Wash the pelleted cells with EGM-2 twice (10 min at 515 x g) and re-suspend the MNCs in EGM-2 at 1.25 x 107 cells/ml. Prepare collagen I coated 6-well tissue culture plates by adding 1 ml rat-tail collagen type I (50 μg/ml) per well and incubating the plate overnight. Pipette 4 ml of this MNC suspension into each well and place the cells in 37 °C, 5% CO2 humidified incubator. A.1.5) After 24 hours (day 1), slowly remove the spent medium (do not disturb the loosely adherent cells) from the well with a pipette, slowly add 4 ml EGM-2 to the well, and return plate to the incubator. On day 2, refresh the medium by slowly removing the medium (do not disturb the loosely adherent cells) from the well with a pipette and adding 4 ml EGM-2 to each well. Repeat the medium change daily until day 7 and every other day thereafter until ECFC colonies appear for cloning. Typically colonies appear between day 5 and day 14 days7(Fig. 1). Visualize typical ECFC colonies with cobblestone morphology using inverted microscope (magnification 10x) and mark the colony boundaries with a marker on the underside of the well to indicate the position of each colony. On day 14, wash these primary colonies 2 times with PBS and harvest individual colonies using cloning cylinders and just enough TrypLE express to cover the cells inside the cylinders. After aspirating the final wash of PBS, place a sterile gel coated cloning cylinder around each colony and press firmly against the plate using sterile forceps. Add 2-3 drops of warm TrypLE express into each cloning cylinder and incubate for 3-5 min until cells within the cylinder begin to detach. Add approximately 250 μl EGM-2 medium into the center of the cylinder and pipette up and down to generate single cell suspension. Transfer the single cell suspension from each cloning cylinder separately into an individual micro-centrifuge tube. Wash the area within the cylinder 2-3 times with approximately 250 μl EGM-2 medium to collect all remaining cells and transfer the wash from each cylinder into the respective micro-centrifuge tube. Centrifuge the cells at high speed (≤300 x g) on tabletop centrifuge for 5 min. Remove the supernatant and re-suspend the cell pellet in 1.5 ml fresh EGM-2 medium. Transfer the cell suspension (containing all the cells from individual colonies) from each tube into one well of a 24-well tissue culture plate pre-coated with 500 μL rat-tail collagen I (50 μg/ml). Place inside the incubator for expansion with media change performed every other day. When cells approach 80-90% confluency, remove the spent medium then wash the cells 2 times with PBS and add 500 μl TrypLE express medium to each well of 24-well tissue culture plate. Place the plate inside the incubator for 3-5 min until cells begin to round up and detach. Add 1 ml of EGM-2 (with 10% defined FBS) to each well to collect the cells by washing and transfer them to a 15 ml tube. Wash the well with 1 ml EGM-2 medium to collect all remaining cells and transfer the wash from each well into respective 15 ml tube. Centrifuge the cells at 300 x g for 5 min. Remove the medium and re-suspend the cell pellet in 1 ml fresh EGM-2 medium (with 10% defined FBS). Obtain the viable cell count of an aliquot using a hemacytometer and trypan blue exclusion. Expand the cells by seeding about 5000 cells/cm2 onto a collagen I pre-coated tissue culture surfaces in EGM-2 media with media change every other day until cells approach 80-90% confluency before sub-culturing again. For endothelial cell surface antigen expression, detach cells with TrypLE express to collect cells by using methods described for ECFC cloning and expansion. Re-suspend cells in FACS staining buffer (10 X 106 cells/ 1ml FACS staining buffer) then add FcR blocking reagent (20 μl/ 10 X 106 cells), mix gently and place on ice for 10 min. Aliquot 100 μl of this cell suspension in micro-centrifuge tube for each endothelial surface antigen and isotype controls. Add appropriate amount of fluorochrome labeled human monoclonal antibodies that recognize endothelial antigens (CD31, CD144, CD146, and CD105) or hematopoietic antigens (CD45, and CD14) and leave on ice for 30 min protected from light. Caution: 1 X 106 cells are not required for each test. The authors typically prepare 0.5 to 1 X 105 cells/tube to obtain 2 X 104 analyzed events. Also, follow the manufacturer's recommendation for the amount of antibody to be used for each test. Some antibodies may require titrating to determine the optimal antibody concentration. All staining that the authors have performed are single color staining. After 30 min of incubation on ice, centrifuge each tube at high speed on a tabletop centrifuge for 5 min then remove the supernatant and re-suspend the cell pellet in FACS buffer. Analyze the samples on a flow cytometer to determine the percentage of cells that stain positively or negatively for each antigen. ECFCs stain uniformly positive for CD31, CD144, and CD146, but negative for CD45 and CD14 compared to the corresponding isotype controls. For single cell assay to examine the clonal proliferative potential, detach early passage (2-3) cells with TrypLE express to collect cells using methods similar to that was described for ECFC cloning and expansion. Infect these cells with enhanced green fluorescent protein (EGFP) expressing lentiviruses 16 and collect cells expressing EGFP by fluorescence cytometry. Caution: Working with lentivirus is considered a biohazard and all bio-safety precautions should be obeyed. Culture them as described for culturing ECFC in the section for ECFC expansion. Prepare Collagen I coated 96-well plates by adding 50 μl rat-tail collagen type I (50 μg/ml) per well and incubate the plate for overnight. Collect the EGFP+ ECFCs by using TrypLE express and resuspend them in EGM-2 medium with final concentration ~106 cells /ml. Use FACS Vantage (Becton Dickson) or other comparable sorter with low flow rate of 20 cells/second to sort one single EGFP+ ECFC per well of a 96-well plate and adjust the final volume to 200 μl per well with EGM-2. Use an inverted fluorescence microscope to ensure that each well received only one cell. Alternatively, single cells can be sorted based on FSC and SSC and Sytox nuclear dye staining the colonies can be used for cell scoring and quantification. Incubate the plate over a period of two weeks with two media changes (200 μl EGM-2 using multichannel pipetter) performed on day 5 and day 10. On day 14 of culture, wash each well with 100 μl PBS before fixing the cells with 100 μl of 4% paraformaldehyde for 30 min. For ECFCs that are not expressing EGFP, add Sytox reagent, a green fluorescent nuclear dye, following paraformaldehyde fixation and incubate at 4 °C overnight. Use a fluorescence microscope to examine each well to quantitate the number of endothelial cells that expanded from a single cell cultured for 14 days. For quantitative analysis, score wells with 2 or more endothelial cells as positive (for proliferation) and examine them further for total endothelial cell count by visual counting with the fluorescence microscope. Prepare cellularized gel implants by calculating the total volume (ml) of each of the following gel materials (with the final concentration in the parenthesis) needed to cast 1-ml gel (which will be later bisected to generate 2 implants): FBS (10%), EBM-2 10:1 (adjust the final volume to 1 ml), sodium bicarbonate (1.5 mg/ml), NaOH (adjust pH to 7.4), HEPES (25 mM), fibronectin (100 μg/ml), and collagen I (1.5 mg/ml). After gel material calculation, detach cells with TrypLE express to collect cells using methods similar to that was described for ECFC cloning and expansion. Obtain a viable cell count of an aliquot using a hemacytometer and trypan blue. Transfer 2.4 million viable cells into a 50 ml-conical tube and pellet the cells by centrifugation at 515 x g, room temperature. Simultaneously, prepare gel matrix solution by adding calculated volumes of HEPES, sodium bicarbonate, EBM-2 10:1, FBS, fibronectin, and collagen to an ice-cold 50-ml conical tube (in the same order as they are listed). Mix thoroughly and adjust the pH to 7.4 with NaOH while keeping solution on ice. Discard the supernatant from the cells after centrifugation and re-suspend the pellet in 360 μl warm EGM-2 and to it add pH adjusted 840 μl of gel matrix solution, making the final volume of gel implant 1 ml. Mix the cells into gel matrix solution slowly until cells are thoroughly suspended in the gel solution. Transfer this 1 ml cellularized gel suspension to one well of a 12-well tissue culture plate and incubate for 20-30 min until the gel polymerizes. Gently cover the gel with 2 ml warm EGM-2 and incubate overnight. Immediately before the implantation, bisect the overnight incubated gel into two equal pieces using iris scissors and return the gel pieces to the same culture well containing EGM-2 medium. Use the animal surgical facility to sedate the animal (5-6 week old NOD/SCID mice) by administrating isoflurane anesthesia. Shave the lower part of abdomen and thoroughly clean the surgical site with alcohol pads and betadine or other antiseptic. Then isolate the area with drapes as per IACUC and institutional guidelines. Using sterile sharp iris scissors to make an approximately 5 mm incision in the lower quadrant of the abdomen, exposing the subcutaneous space between the skin and abdominal muscle. Perform blunt-dissection through the dermal layer from the abdominal muscle to create a 15-20 mm wide pocket leading superior into the upper abdominal quadrant. Repeat similar procedure to create similar open pocket in another side of the same mouse abdomen. Insert one half piece of gel into one side of abdominal pocket and another half piece of gel into another side of the abdominal pocket by lifting the dermal layer just caudal to the incision. After insertion of gels, close each incision with 2-3 stitches using 5-0 polypropylene suture on a cutting needle. Appropriately label the cage cards and perform post-surgical monitoring and analgesia as per the institutional and protocol requirements and allow 14 days for cells in these implanted gels to generate de novo vasculature. Finally, harvesting of gel implants is typically performed 14 days after implantation after euthanizing the mouse. Swab the abdominal area with alcohol pads and cut the abdominal skin caudal to the original incision line. Carefully, dissect out the implant by excising a flap of skin caudal to the probable location of the gel. Excise the implant by cutting circumferentially around the gel then place in zinc fixative (BD Biosciences, follow manufacturer's recommendation for optimal results) and allow them to fix for 1-2 hours at room temperature. Prepare the paraffin-embedded gels using standard histochemical protocols and prepare 5 μm sections on glass slides to perform staining with hematoxylin and eosin, anti-human CD31 or anti-mouse CD31 to visualize the vasculature within the gel. ECFCs undergo de novo vasculogenesis to generate humanized vessels in cellularized gel implants inserted into immunodeficient mice for 14 days 4,8,11. Using this ECFC derivation technique we have observed out-growth of primary colony formation as early as day 5 (Fig. 1). The out-growth ECFC colonies exhibited typical cobblestone appearance and gave rise to >40 population doublings upon long term expansion after colony pickup by cloning. Expanded colonies expressed endothelial antigens, but did not express hematopoietic antigens (Fig. 2). Importantly, they displayed a complete hierarchy of clonal proliferative potential at a single cell level (Fig. 3). Moreover, ECFCs formed humanized blood vessels that are perfused with host RBCs when implanted into immunodeficient mice4, 6, 8, 11 (Fig. 4). Figure 1. Isolation of mononuclear cells (MNCs) from cord blood and outgrowth of endothelial colony forming cells (ECFCs) from cultured MNCs. MNCs form buffy coat layer during Ficoll-Pague density gradient separation of cord blood cells. Isolation of buffy coat layer to culture MNCs on rat-tail collagen I coated plates results in outgrowth of ECFC colony in 5 to 14 days. The outgrowth ECFC colony (indicated by arrow heads) displayed cobblestone morphology7. Figure 2. Representative in vitro phenotypic assessment of endothelial and hematopoietic cell surface antigen expression. 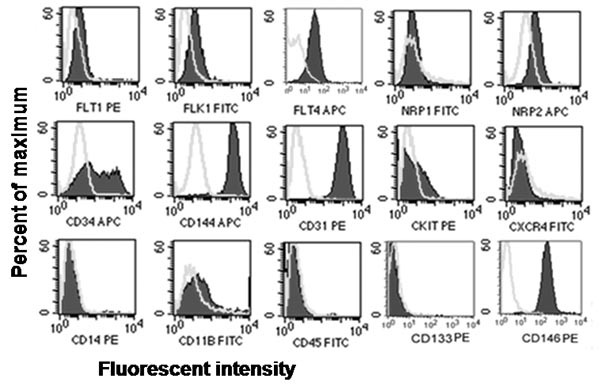 Immunophenotyping of cord blood-derived ECFCs revealed that ECFCs expressed endothelial antigens CD31, CD34, CD144, CD146, Flt-1, Flk-1, Flt-4, and Nrp2 but did not express hematopoietic antigens CD45, CD14, CD11b, cKit, CXCR4 or AC1337, 8. Figure 3. Representative in vitro quantitation of the clonogenic and proliferative potential of CB derived ECFCs. (A) cord blood-derived ECFCs display clonal proliferative potential with a hierarchy of colonies ranging from clusters of 2-50 cells up to colonies of >2001. (B) Micrographs of hierarchy of colonies (colonies stained with, Sytox, a green fluorescent nuclear dye to take better quality pictures) obtained after cord blood-derived ECFCs were cultured at a single cell level for 14 days. Scale bar represents 100μm7, 8. Figure 4. Representative in vivo functional characterization of cord blood-derived ECFCs. A) H&E staining of cord blood-derived ECFC containing cellularized gel implants indicated microvessel (filled with host RBCs) formation in collagen-fibronectin gel after 14 days of implantation. B) Anti-human CD31 staining (brown staining) further confirms the human origin of these vessels. Phenotypic and functional characterization of putative endothelial progenitor cells is important to identify the bona fide ECFCs that are capable of clonally and serially re-plating in culture and give rise to durable and functional implantable blood vessels in vivo. Human umbilical cord blood is enriched with ECFCs and the concentration of these circulating cells declines with aging or disease10. Recent studies suggest that ECFC may play important roles in vascular repair or regeneration in situations of vascular injury, myocardial infarction, or retinopathy17-19. Here, we have described simple and efficient methodologies for the derivation, cloning, expansion, and in vitro as well as in vivo characterization of ECFCs from human umbilical CB. These approaches enable researchers to identify and isolate bona fide EPCs from CB which possess clonal proliferative potential and in vivo vessel forming ability. Dr. Yoder is consultant to EndGenitor Technologies, Inc. and a member of the board of Rimedion Technologies, Inc.
Carmeliet, P., Jain, R. K. Molecular mechanisms and clinical applications of angiogenesis. Nature. 473, 298-307 (2011). Asahara, T. Isolation of putative progenitor endothelial cells for angiogenesis. Science. 275, 964-967 (1997). Urbich, C., Dimmeler, S. Endothelial progenitor cells: characterization and role in vascular biology. Circ. Res. 95, 343-353 (2004). Critser, P. J., Voytik-Harbin, S. L., Yoder, M. C. Isolating and defining cells to engineer human blood vessels. Cell. Prolif. 44, 15-21 (2011). Matthias, M., David, N., Josef, N. From bench to bedside: what physicians need to know about endothelial progenitor cells. Am. J. Med. 124, 489-4897 (2011). Ingram, D. A. Vessel wall-derived endothelial cells rapidly proliferate because they contain a complete hierarchy of endothelial progenitor cells. Blood. 105, 2783-276 (2005). 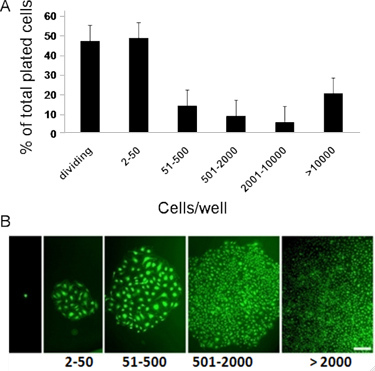 Reinisch, A., Strunk, D. Isolation and Animal Serum Free Expansion of Human Umbilical Cord Derived Mesenchymal Stromal Cells (MSCs) and Endothelial Colony Forming Progenitor Cells (ECFCs. J. Vis. Exp. (32), e1525 (2009). Au, P. Differential in vivo potential of endothelial progenitor cells from human umbilical cord blood and adult peripheral blood to form functional long-lasting vessels. Blood. 111, 1302-135 (2008). Critser, P. J., Kreger, S. T., Voytik-Harbin, S. L., Yoder, M. C. Collagen matrix physical properties modulate endothelial colony forming cell-derived vessels in vivo. Microvasc. Res. 80, 23-30 (2010). Melero-Martin, J. M. Engineering robust and functional vascular networks in vivo with human adult and cord blood-derived progenitor cells. Circ. Res. 103, 194-202 (2008). Hofmann, N. A., Reinisch, A., Strunk, D. Isolation and Large Scale Expansion of Adult Human Endothelial Colony Forming Progenitor Cells. J. Vis. Exp. (32), e1524 (2009). Lin, Y., Weisdorf, D. J., Solovey, A., Hebbel, R. P. Origins of circulating endothelial cells and endothelial outgrowth from blood. J. Clin. Invest. 105, 71-77 (2000). Witting, S. R. Efficient Large Volume Lentiviral Vector Production Using Flow Electroporation. Hum. Gene. Ther. (2011). Yoon, C. H. Synergistic neovascularization by mixed transplantation of early endothelial progenitor cells and late outgrowth endothelial cells: the role of angiogenic cytokines and matrix metalloproteinases. Circulation. 112-1618 (2005). Dubois, C. Differential effects of progenitor cell populations on left ventricular remodeling and myocardial neovascularization after myocardial infarction. J. Am. Coll. Cardiol. 55, 2232-2243 (2010). Medina, R. J., O'Neill, C. L., Humphreys, M. W., Gardiner, T. A., Stitt, A. W. Outgrowth endothelial cells: characterization and their potential for reversing ischemic retinopathy. Invest. Ophthalmol. Vis. Sci. 51, 5906-5913 (2010).